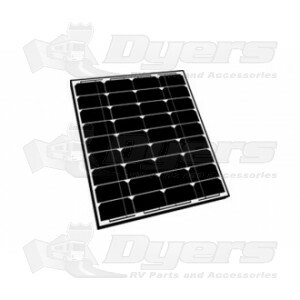 High Output Monocrystalline Solar Panels mount on the roof of your RV or trailer to charge your batteries and help run household appliances. Uses the highest efficiency solar technology on the market today. Works with all types of rechargeable 12-volt batteries. Includes wiring, quick connect adapter and mounting hardware. Work best in sunny climates. 12-Volt Solar Charge Controller required best with 28 Ampere Charge Controller. Pair with an inverter for silent AC power.